What if we told you we could save you up to 80% on Azure consumption costs? Committing to reserved instances allows you to plan your budgets, keep your vital workloads running and keep your costs efficient – all with the continued support and innovation from the S3 team that we have become known for. Take advantage of the fantastic price savings available when you commit your VM’s to Azure for either 1 or 3 year terms, and save up to 72% when compared to pay-as-you-go-pricing. 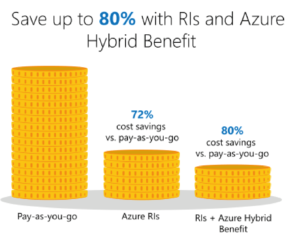 Save an extra 8% when combining Reserved Instances with the Hybrid Benefit. This allows you to save money on your Azure consumption by moving existing on-premise licenses into the cloud. For each Windows Server licence we help you move into Azure, you will pay only for the base compute costs – with the price of the OS covered for up to two virtual machines. What’s more if you have existing SQL server licenses, you can also save up to 55% when moving them into Azure as well!